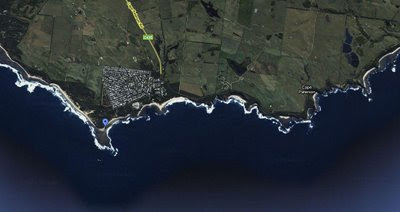 I visited my friend Simon staying at the Cape Paterson caravan park. 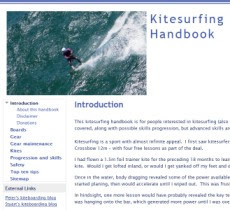 I took my kite gear hoping for to kitesurf either at Inverloch or at the Cape itself. The main beach has a gently surf and a nice reef at the western end. The breeze seemed OK on Saturday afternoon so Simon helped me launch my 14m kite. But there was not enough wind. I was able to get out a bit and come back, but could not go upwind. After a couple of walks back along the beach, with bemused lifesavers peering down from their club house, I packed up. I had a similar session on Sunday, but this time the promising breeze vanished as I got on the water, so I blew in to the beach just short of the rocky reef section to the east. It is a nice spot, but not really suitable for beginnners. endless bays and angals , looks grate.